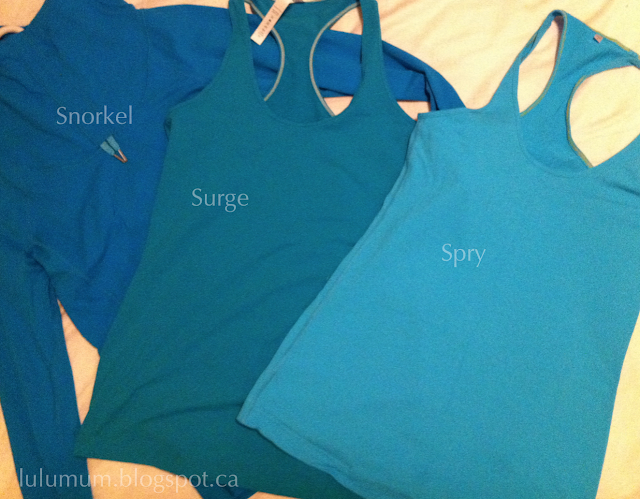 I took a picture this morning of my new Surge Cool Racerback (made in Canada!!) next to Spry and my Snorkel Ambition Pullover (luxtreme). I was surprised at how green Surge is next to those two colors which I already felt where on the greener side of blues. I didn’t bother to use some of my other blues (Pigment, Cornflower, Beaming) because those have zero green tones in them and I wanted to stick with the most similar blues I have since I was trying to decide if the color was too close to what I have to keep. Its definitely a keeper. I’d love to see Surge compared with Teal Zeal but I very sadly don’t own that one.